OnBoard sets a new standard for what is already the world’s most advanced board meeting software solution. 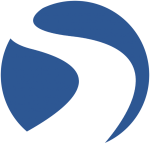 From deploying releases whenever’s best for your organization to fully customizable home dashboard, we are giving more control to organizations over their board portal. The Dashboard is the personalized homepage for every organization. Administrators can leverage a set of modules to create a tailored home for their organization. Those modules include: An Organization Welcome Screen, Upcoming Meetings, Resources, and News and Announcements. Each module is easily customizable, allowing you to rename, reorganize, and restructure the page to suit your organization’s needs. 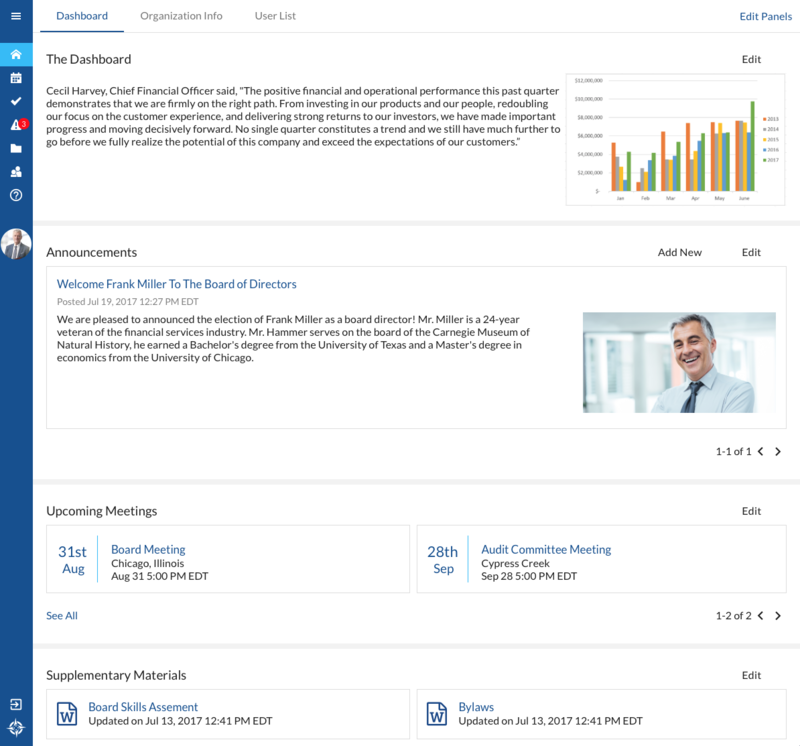 More than just quick links to documents and board materials, by leveraging the resource panel organizations can now populate web, SharePoint, and other links directly on the dashboard. Giving you the tools to create a homepage as unique as your organization. Directors will now have a single place to access their most pertinent materials. Quickly examining upcoming meetings, instant one-touch access to supplementary materials and announcements. When a meeting is imminent, when administrators need to finish preparing all the materials for the board, OnBoard Customer Scheduled Updates gives you more control than ever. 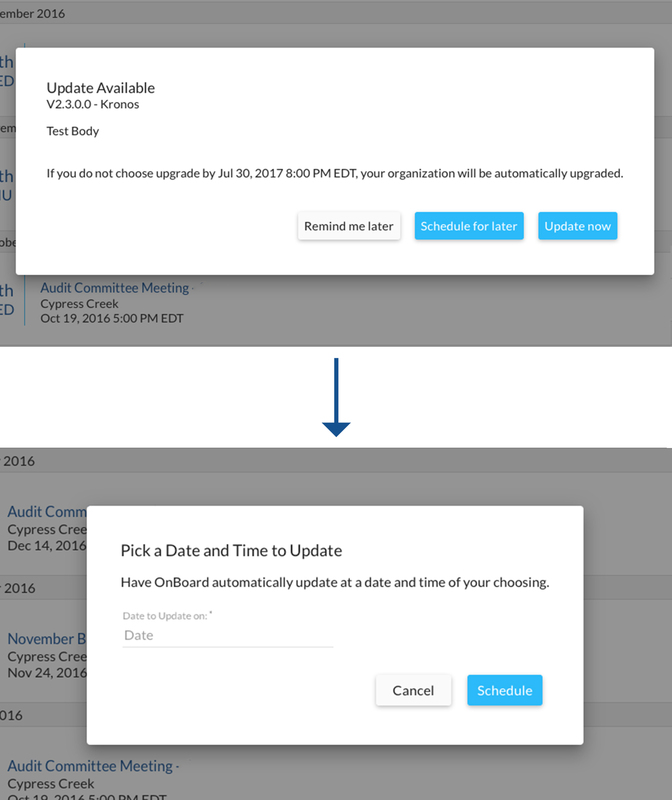 Scheduled Updates offers administrators the choice of how and when they deploy new OnBoard releases across their organization. A first in the world, groundbreaking, enhancement for Cloud Solutions, Customer Scheduled Updates removes any concern that deploying the latest OnBoard features and capabilities will interrupt your vital board work. Board meetings are a high-stakes responsibility, and any additional anxiety is unwelcome. Now, whenever an OnBoard release is implemented, administrators will encounter a simple screen offering you the option to immediately deploy the release across the entire organization or simply schedule for later. It’s up to you, so you focus on what’s important.